Two friends who have known each other for 30 years were amazed to find out they are sisters. Deborah Day was adopted at two months old, separating her from big sister Marilyn Morris, reports The Sun. They met again as teenagers working in a supermarket and became friends but had no idea they were related. They lost touch again but the truth came out when oldest sister Sally Griffiths launched a search for her lost family. 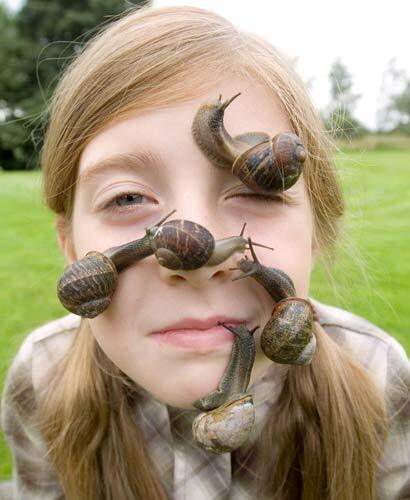 A nine-year-old Cheshire schoolgirl has broken the world record for having the most snails on her face at once. Tiana Walton allowed 25 of the slimy creatures to cover her eyes, nose and mouth – beating the previous record of 15 held by Australian Liam Kenny. Before her record breaking attempt, now in the Guinness Book of World Records, Tiana’s previous personal best was just nine. She had just one minute to put the snails on her face and then had to tip her head forward for 10 seconds. Any snails that fell off during that period were not counted. In June, officers received a tip about drug activity at the USA Motel on Dixie Highway. Police dogs searched the room and found marijuana packaged for sale, scales and cash. Police arrested 19-year-old Gregory Griggs and charged him with trafficking marijuana. When arrested Griggs was wearing a T-shirt that read “It’s not ILLEGAL unless you get CAUGHT”. Maybe a little more practice…nah. Maybe not. Police say a [Vermont] man was recovering from a gunshot wound after he shot himself in the leg with a handgun while practicing a quick draw. Police said a bullet from a revolver entered the 61-year-old man’s leg just below the left knee and lodged in his foot. October 17, 2008 Posted by oldstersview | Dumb Stuff	| quick draw | Comments Off on Maybe a little more practice…nah. Maybe not.